Honda Motor Co., Ltd. unveiled on October 31, 2015 the world premiere of the planned production model of its all-new fuel cell vehicle (FCV), CLARITY FUEL CELL, at the 44th Tokyo Motor Show 2015. This model will be on display at the Honda booth during the Tokyo Motor Show. (Press days: October 28-29, 2015 / Public days: October 30 – November 8, 2015). The all-new CLARITY FUEL CELL fuses the ease of use of a gasoline-powered vehicle and values that are unique to a FCV at a high level. This fusion gives this sedan-type FCV high value and potential to set a benchmark for FCVs now and in the future. Employing original Honda technologies, the fuel cell stack for this model was downsized by 33% compared to the previous version of the fuel cell stack and yet output of more than 100kW and output density of 3.1kW/L*1 – approximately a 60% improvement – were achieved. The fuel cell powertrain was made as compact as a V6 engine*2, and thus it was made possible to consolidate it under the hood of a sedan-type vehicle for the first time in the world*3. This powertrain layout enabled a full cabin package that seats five adults comfortably. Combined with improved efficiency of the powertrain and a reduced energy requirement for driving, a 70MPa high-pressure hydrogen storage tank installed to this vehicle provides a cruising range of more than 700 km*4(Honda internal measurement for Japan market only), the top-class cruising range among all FCVs. The tank can be refilled in approximately three minutes*5, realizing ease of use equivalent to that of a gasoline-powered vehicle. Furthermore, the high-output motor with maximum output of 130kW*1 realizes both direct, highly-responsive and exhilarating driving experience and excellent quietness at the same time. In addition, when combined with an external power feeding device, the Power Exporter 9000, the all-new CLARITY FUEL CELL can function as a “power plant on wheels” that generates and provides electricity to the community in times of a disaster or other events. Honda will begin lease sales in Japan of this all-new CLARITY FUEL CELL in March 2016. For the first year after the start of sales in Japan, Honda will focus on sales mainly to local government bodies or business customers which Honda has already been working together for the popularization of FCVs. During this period, Honda will collect information about the in-market use situation, including the external power feeding device, and gather diverse opinions from customers and other relevant organizations, then later begin sales to individual customers. Honda will begin with small-volume production at the Production Supervisory Unit and Powertrain Production Supervisory Unit (located in Takanezawa-machi, Shioya-gun, Tochigi, Japan. ), then eventually expand production volume and begin regular sales along with lease sales. 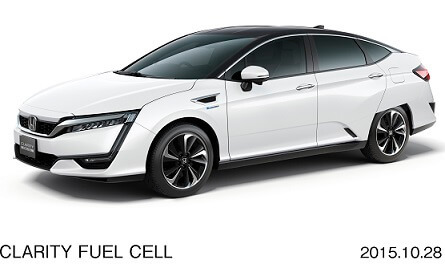 The sales price*6 of CLARITY FUEL CELL in Japan will be 7.66 million yen (including consumption tax) for Japan market only (US price to be announced). The Power Exporter 9000, which has the capacity to feed approximately seven-days’ worth*7 of electricity for an average household, is scheduled to go on sale at the same time as the CLARITY FUEL CELL. CLARITY FUEL CELL will be sequentially evolved into the U.S. and Europe. Honda was one of the first automakers to begin focusing attention to hydrogen as a possible solution for issues such as global warming and depletion of fossil fuels. Honda has been positioning the FCV, which emits only water, as the ultimate environmentally-responsible vehicle and has taken a proactive approach to the research and development of FCVs since the late 1980s. In 2002, the Honda FCX became the first fuel cell vehicle in the world to be certified by the U.S. Environmental Protection Agency (EPA) and the California Air Resources Board (CARB). With these certifications, Honda began lease sales of the Honda FCX in Japan and the U.S. In 2008, Honda became the first automaker to begin lease sales of the FCX Clarity, which featured an innovative sedan-type package and unprecedented driving experience. 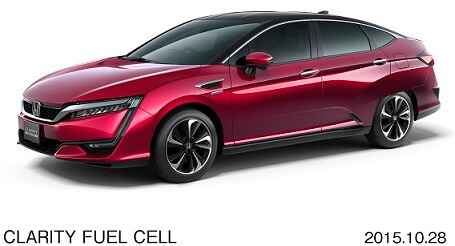 The all-new CLARITY FUEL CELL was developed based on various data related to the ease of use and driving performance of these previous Honda FCVs. *5 Honda internal measures using 70MPa station in the exterior temperature of 20 degrees Celsius. Time required for refueling may vary depending on conditions. *6 This model is currently available exclusively for lease sales. The lease price varies depending on lease terms and plans etc.